Zone 1 Tube station on the Circle and District lines. It's also a rail station, and the next station south from City Thameslink on the Thameslink lines; the line splits south of here to go via either Elephant & Castle on a little tour of south London taking in Sutton and Wimbledon, or London Bridge to East Croydon, Gatwick, and eventually Brighton. 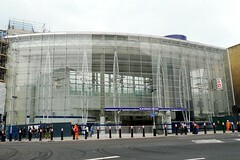 The station now has two entrances, one on each side of the Thames. The southern entrance opened in December 2011 photo. The main station building on the north side of Blackfriars Bridge was opened in early 2012 replacing the earlier entrance photo. Last edited 2013-10-11 10:12:43 (version 17; diff). List all versions. Page last edited 2013-10-11 10:12:43 (version 17).